With the high price of gold, jewelry makers are looking to incorporate alternative metals into their lines. I frequently work with palladium and stainless steel in my shop. The following are a few tips and tricks you can use to work more effectively with these alternative metals. Whenever I solder palladium and have to forge it afterward, I steer clear of palladium or platinum solders, opting instead for 20 karat white gold hard solder. This enables me to have seams that can withstand the various types of forging I do to combine palladium with other alternative metals, such as stainless steel. If the solder seams are precise and meet well, it is difficult to detect any color difference. 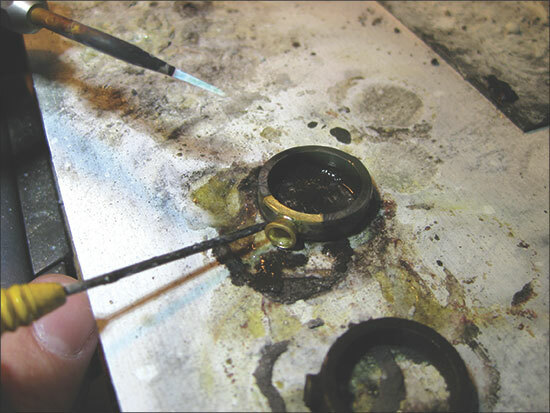 Also, for the best and cleanest results when soldering stainless to other metals, opt for an oxygen/propane torch, which allows you to work with virtually any metal combination that can be soldered. I use the Smith Little Torch. While you can use acetylene, it isn’t appropriate for platinum group metals. Stainless steel finishing may at first seem difficult, but it is actually very easy to do if you follow a few simple extra steps. First, treat stainless more like platinum than gold: It takes more time and effort to achieve the best possible finish. I use a seven-step abrasive process, typically beginning at 120 grit (depending on the starting surface) and proceeding all the way to 2,000 grit. 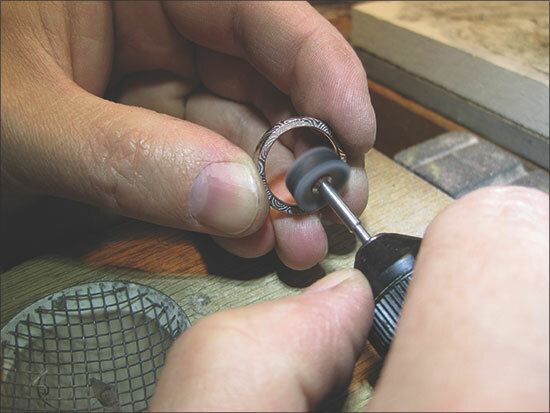 This is much more labor-intensive than gold and silver finishing, which can be accomplished with three to four abrasive steps prior to pre-polishing. After touching up the steel with rubberized abrasives where necessary, I use White Diamond polishing compound followed by blue rouge. While this can be done on the polishing lathe, I find that I achieve the best results with medium to hard felts at the bench (with dust collection, of course).